“As the evidence of dark matter’s existence has become overwhelming, understanding its nature and interactions through the observation of both direct...and indirect...dark matter detection has become an increasingly vigorous field of inquiry,” writes Gary Prézeau in his new study, which can be found at the arXiv pre-print server. Indeed, detecting dark matter has proven to be much easier said than done. This elusive form of matter, though it may account for nearly 85% of all the stuff in the Universe, has never been detected directly. It doesn’t emit or absorb light, or any other electromagnetic radiation. 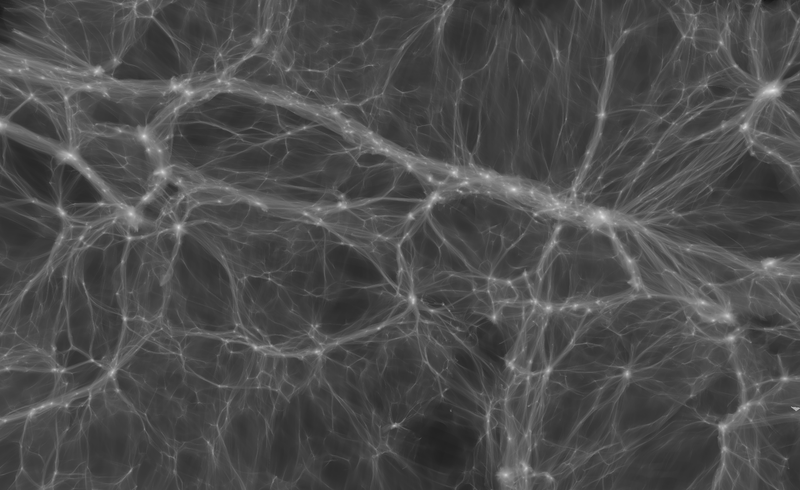 It’s hypothesized that dark matter only interacts with our visible universe through gravity. Thus, it’s predicted to manifest as halos, discs, and streams. [Prézeau] wondered what would happen if a stream of dark matter pierced a planet like Earth. He calculated that the planet’s gravity would bend the particles’ trajectories and focus them to a point. This “lensing” effect would concentrate dark matter along an axis passing through Earth’s core, reaching densities about a billion times more than average at the focal point. Which is awesome news if he’s right; given that the “root” of the dark matter hair—its singular focal point—is predicted to extend about a million kilometers above Earth (which is beyond the Moon), we could set up a space-based detector in the vicinity to search for it. What’s more, because there are millions of streams flowing through our solar system, we could also perform searches around larger bodies such as Jupiter and Saturn. A hair would provide a uniquely powerful laboratory to study dark matter interactions. Hairs are unique windows into the fine structure of the local dark matter streams. A hair discovered near Earth (or Jupiter) would find counterparts in all solar system bodies providing a powerful universal tool to probe the interior of almost any planet or moon. Prézeau says that locating these hairs “is likely to be challenging,” but may be facilitated by the fact that the extreme densities of these hairs are distinguishable from their velocity. Read the entire study at the preprint arXiv: “Dense Dark Matter Hairs Spreading Out from Earth, Jupiter and Other Compact Bodies”.